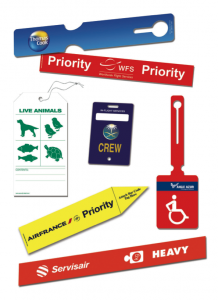 With the complete range of material used for the check-in of passengers, SECURITY LABEL is proud to be considered as one of the leading manufacturers of Baggage Tags, Boarding Passes, Tickets and all other kinds of Airline Documents. More than 400 airlines, airports and handling agents in more than 150 countries worldwide rely on our product range, which comprises more than 100 different products, all designed, produced and finished according to our customer’s requirements and complying with the IATA standards. SECURITY LABEL is in a position to produce all types of Baggage Tags, even the old string and eyelet products and was very well involved in the development of the next generation of the “Automated Thermal Baggage Tag”, for RFID Baggage Tags and even for the common-use-self-system (CUSS), SECURITY LABEL has developed special Baggage Tags in order to facilitate handling for the passenger as much as possible. SECURITY LABEL is well known for utmost service, just in time deliveries and perfect products. Last but not least, market research and discussions with customers and the IATA always help to understand your needs and to adapt our products constantly to your demand. Most of the Baggage Tags used are Thermal Baggage Tags. As strategic IATA partner SECURITY LABEL produces them according to IATA resolution 740 and Recommended Practice 1740. Superior raw material and utmost production quality grant a minimum of “Lost Baggage” to airlines, airports and handling agents. 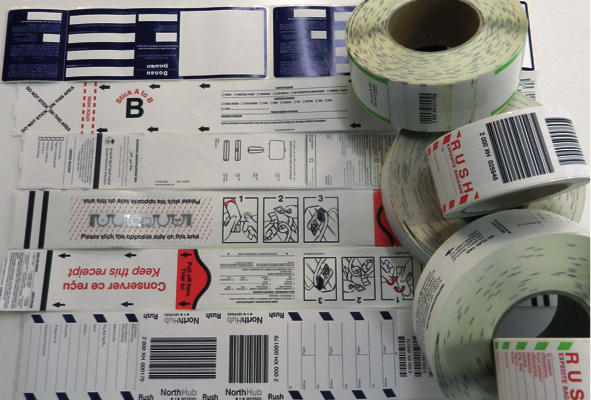 Continuous development by SECURITY LABEL assures simple and fast handling of the tags as well on the check-in counter as with self-service automates. Close to the customers and as strategic partner of the IATA, SECURITY LABEL is always familiar with the latest developments. Our new Inno-Tag corresponds with our customer’s requirement of saving cost, as with same outer diameter of rolls, you can have up to 80% more tags per roll. This means less freight charges, less storage space and less changes of rolls which results in cost savings up to 15%. 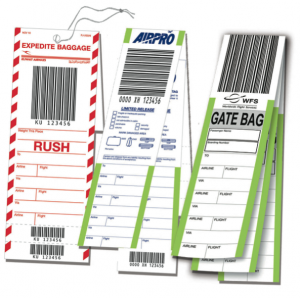 For technical reasons, many destinations are using manual Baggage Tags. SECURITY LABEL as IATA partner has continuously developed them on the highest level, always respecting IATA resolution 740. Superior quality and simple handling as well as high-quality copies allow fast check-in with all necessary vouchers and stubs. 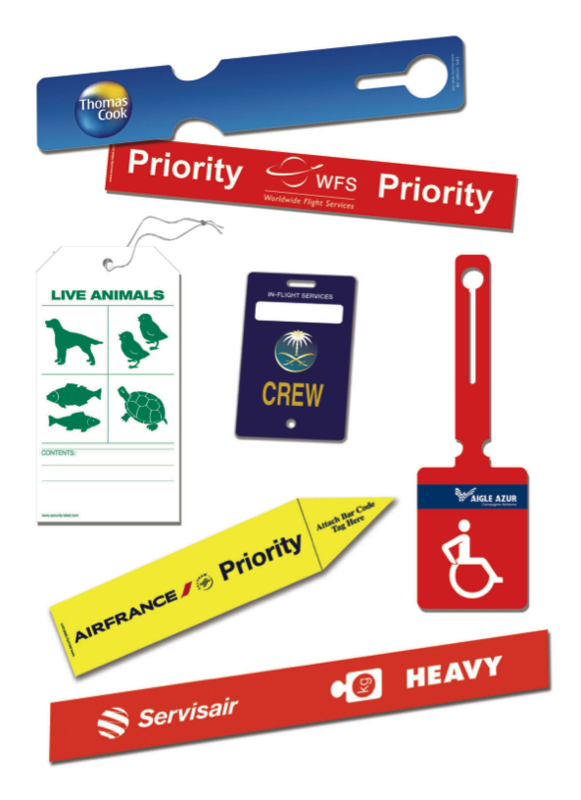 As a response to customer’s requirements, SECURITY LABEL has been producing Thermal Baggage Tags with RFID Inlay for some years. Barcode identification of luggage in the sorting device, the container or the plane is only possible when the barcode is visible and in proper condition. 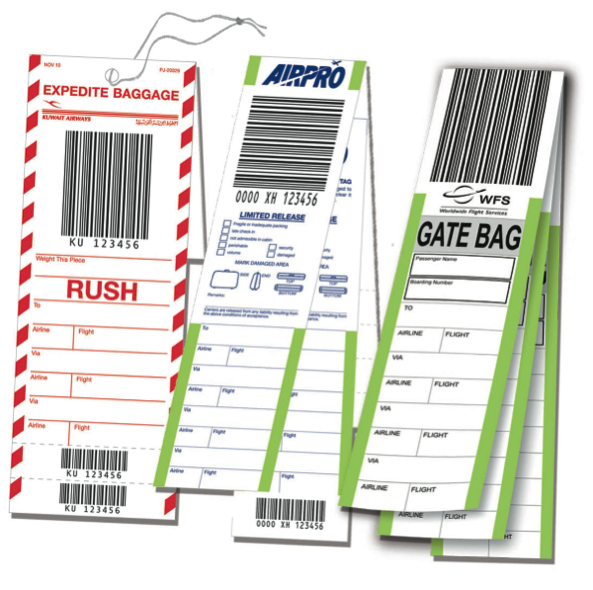 RFID baggage tags do not only have printed barcodes but also implemented RFID chips for storage of passenger related data. By means of radio frequency, the RFID chip can be read with a rate of 99,9 % by all readers. Granted detection reduces misrouting and transshipments thus ensuring all luggage to be supplied at the correct destination in time. Some airports have already implemented RFID technology and are constantly using RFID Baggage Tags. 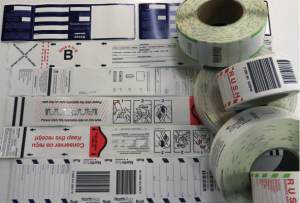 SECURITY LABEL is capable to produce each quantity with IATA specified inlays within short notice, granting 100 % checked tags per roll. Of course implementation of RFID Inlays is possible for all other types of SECURITY LABEL Baggage Tags, too. Name Tags to be made available in check-in areas by the airlines to their passengers including corresponding display boxes if requested.